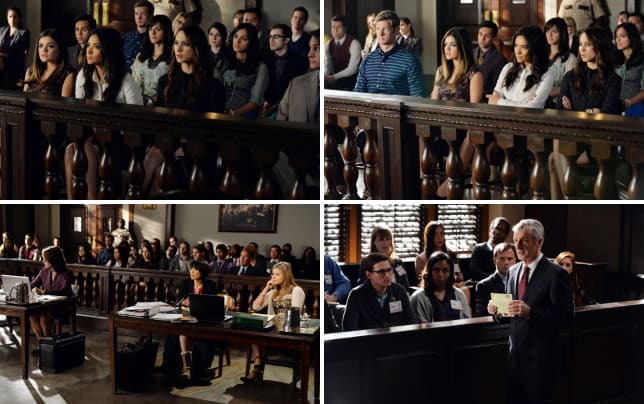 Will Alison be found guilty? That is the main question as we head into Pretty Little Liars Season 5 Episode 24. Based on the official episode description, we know the case draws to a close, but not before a surprise witness appears and throws all the liars under the bus. Will any of the liars be forced to take the stand? Ezra and Caleb team up to help the liars, but their plan goes awry when they are attacked by arrows. Is it A making a final move to the seal the fate of the liars? Why is Andrew at court? Is he hoping Alison is found guilty? Most likely, given the events of Pretty Little Liars Season 5 Episode 23. What is A's plan for Mike? We know that A will target him for much of "I'm a Good Girl I Am," and in the pictures you can see that he looks a bit worse for wear. Will he be able to escApe the episode unscAthed? Everything is up in the air until we get to see this hour. As always, come back after it airs for a full rundown. Remember you can watch Pretty Little Liars online, right here on TV Fanatic. Get caught up now! Pretty Little Liars Season 5 Episode 24 airs Tuesday March 17th at 8/7c on ABC Family.